Is the game too brutal? Crunch. The ferocity of the tackle knocked both men senseless and the shockwaves reverberated around the stadium and across the globe to an audience of millions. 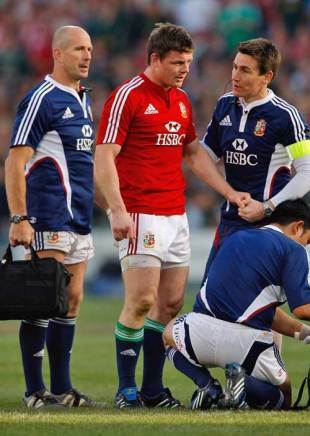 If ever a moment summed up the enthralling but brutal nature of the modern game the bone-crunching meeting of British & Irish Lions centre Brian O'Driscoll and South Africa flanker Danie Rossouw earlier this year was it - but it also arguably served as a watershed, or should that be a bloodshed, moment for the sport. The Lions' heart-breaking defeat to the Springboks at Loftus Versfeld in June produced many casualties and in the wake of that epic clash, respected Lions doctor James Robson aired his fears that players have got "too big for their skill levels" and that they are now a "too muscle-bound and too bulky". But has rugby really evolved into a series of head-on collisions? And is the sport that has long prided itself on being for all shapes and sizes now just the domain of muscular hulks? In an exclusive study conducted with our data partner Opta, our broadcast colleagues ESPN Classic and the Independent on Sunday, we compared the recent battle in Pretoria with the 1971 tour clash between the Lions and New Zealand in Christchurch and the results add weight to the argument that the sport is now a power-based spectacle revolving around the all-important collision. Perhaps the most telling indicator in the changing shape of the game is the size of the players themselves. The average weight of the players that went toe-to-toe in Christchurch in 1971 was 14st 1lb with their 2009 counterparts tipping the scale at 16st 4lb. But that significant weight difference is only part of the story. The tackle toll is another telling factor with this year's encounter producing an eye-watering 181 tackles - three times as many as the '71 clash that also included many more missed tackles. This fact underlines the increasing importance of defensive structures and is also backed up by the anecdotal evidence. "Tackling was much more a specialist job in those days," recalled former Wales and Lions international, and ESPNScrum columnist, John Taylor. "You didn't expect [fly-half] Barry John to make any tackles and he would say that's your job, give me the ball, I'm the class and you're the donkey who does all my tackling for me." The style of tackling on show in '71 has little resemblance to the gladiatorial approach of the game's leading protagonists in Pretoria. The direct running and player on player confrontations that are a common facet of the modern game rarely featured in '71 with high tackle from All Black Bryan Williams on Lions fullback JPR Williams the exception rather than the norm. The textbook tackle could also be found in the '09 clash but it appeared alongside its x-rated cousin, the no arm tackle. The ruck was the subject of much controversy earlier this year with Springboks lock Bakkies Botha's clearing out of Lions prop Adam Jones leading to a two-week ban and the end of the Welshman's tour. That one incident took place at one of 139 rucks that peppered the game and dwarfs the 16 that took place in 1971 although the latter figure can be largely accredited to the All Blacks forward dominance. The scrum and the lineout have witnessed the most dramatic changes in the 38 years between the two games. The scrum was a more common sight in '71 but the set piece is a far cry from its modern equivalent where the 'hit' is now markedly more emphatic. When you combine the increased weight - the 2009 packs outweigh their '71 predecessors by a combined 35 stone - with that added intensity at impact the capacity for injury is clearly evident. The aerial battle that has drawn scorn of late was non-existent in '71 and as a result the headlong contest for the high ball that is a common sight in the game today did not feature. In addition, a decrease in the number of clean breaks and offloads hints at even more collisions across the field of play in today's game. "With the size of the guys and how dynamic they are now, the intensity is shuddering. The sheer physicality of the second Test this year was incredible." The changes in the physical side of the game go beyond the bruising yet crowd-pleasing increase in collisions. Despite a momentum-choking total of 92 scrums and lineouts, the pattern of the '71 game retained an open feel perhaps due to the Lions' approach that was a reflection of the Welsh influence at a coaching and playing level. That reliance on a running game will have tested the stamina of even the fittest player but would not have close to the demands on the modern international player. Although an official ball in play time is not available for the '71 fixture, analysis of other matches from the period suggests the ball was alive for approximately 30% of the game. In comparison, this year's clash produced a figure of 47% which in relative terms means it witnessed just over 50% more ball in play time than games typical of the '71 clash. "Player on player, and everywhere on the field, it is more brutal today," added Taylor who as well as playing in '71 was an avid spectator in South Africa this year. "With the size of the guys and how dynamic they are now, the intensity is shuddering. The sheer physicality of the second Test this year was incredible." There is no doubting that the 1971 game was a formidable physical challenge for the players with the energy-sapping pattern of set pieces but it was evidently less demanding when it comes to contact be that at scrum time, at the tackle or breakdown. And it is that increase in physicality that is causing increasing concern and should be of particular interest of those governing the game and protecting the players. In 1971, 30 players were picked for 26 matches including four Tests with three additional players called up for injuries during the tour. There were just two substitutes in four Tests (one for Lions in first Test, one for NZ in third) - there were no tactical replacements in those days. In 2009, 37 players picked for 10 matches including three Tests with six additional players called up for injuries during the tour. A total of 33 substitutes were used in the three Tests (seven for SA and five for Lions in first Test; five and five in second; five and six in third) with some having been tactical changes.